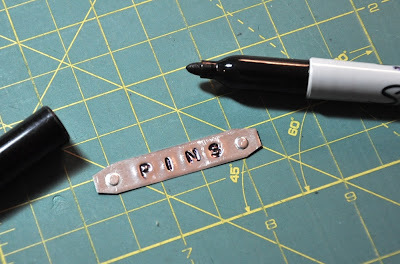 Part 3 of the Bitty Bowl of Pins Tutorial. 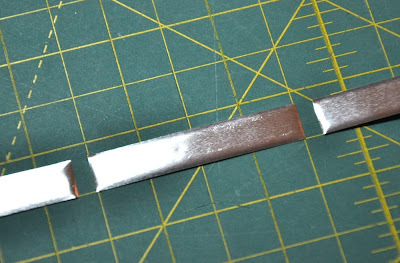 Let's begin by cutting a 3/8" strip of silver metal. The metal is a bit heavier than heavy tinfoil. I just used a ruler and one of my older blades. It cuts easily with no problem at all. 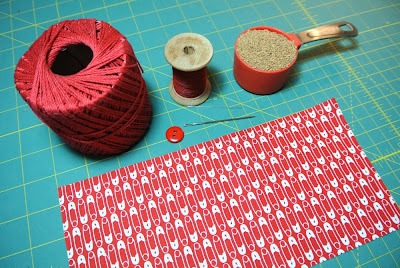 Then cut the 3/8" strip into 2" lengths. 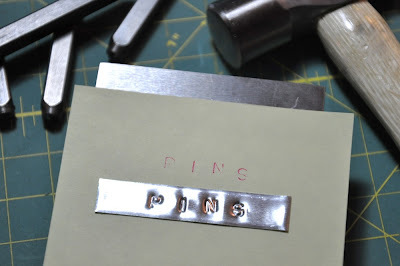 Find the letter stamps for P, I, N, and S .
Line them up and tap letters on stamp pad and then stamp on a sticky note. 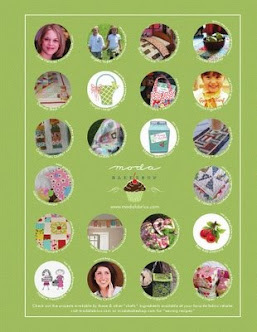 This will be your stamping guide. Line the metal up with the stamped letters on the sticky note so that the letters fall in the center of the metal as seen in the picture below. 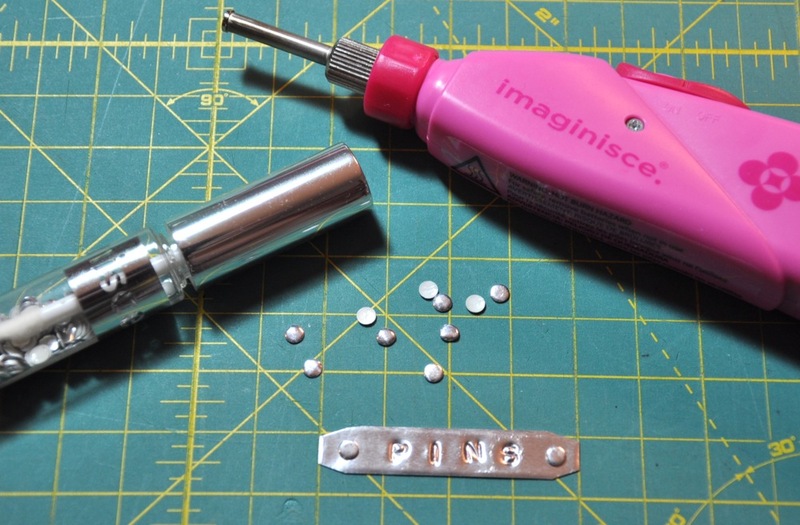 Now take the first letter P and lightly tap the top of the metal stamp with a hammer. You really don't have to hit very hard as the metal is very soft. 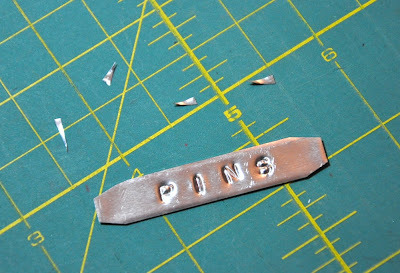 You can practice on a piece of scrap metal to get a feel for how hard you will want to hit the the metal stamp. Continue the process with the remaining 3 letters, I, N, and S.
Using your rotary cutter (with an old blade) cut just a snippet of metal off each corner at an angle. 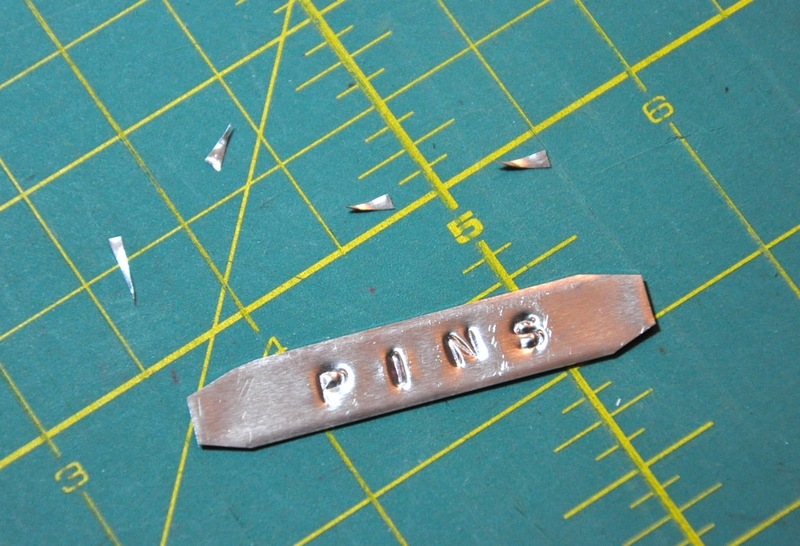 You have two choices for the metal rivots on each side of the PINS letters. On the original pincushion I used silver brads and an 1/8" hole punch as seen in the picture below. 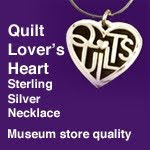 Or you can use the a silver iRock gems. 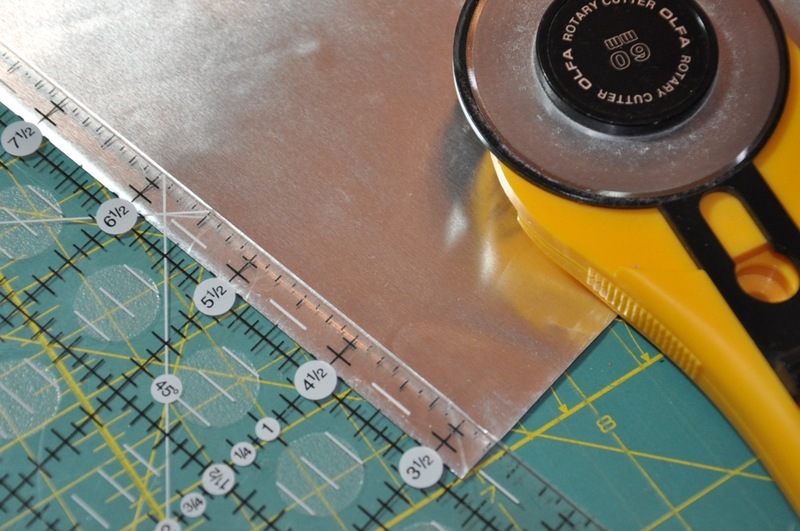 They are attached using the heated application tool as seen in the picture below. The letters are made black by filling in each letter with a sharpie pen. Then rub off any excess with a scrap of batting. Attach mini glue dots to the back of the metal sign. 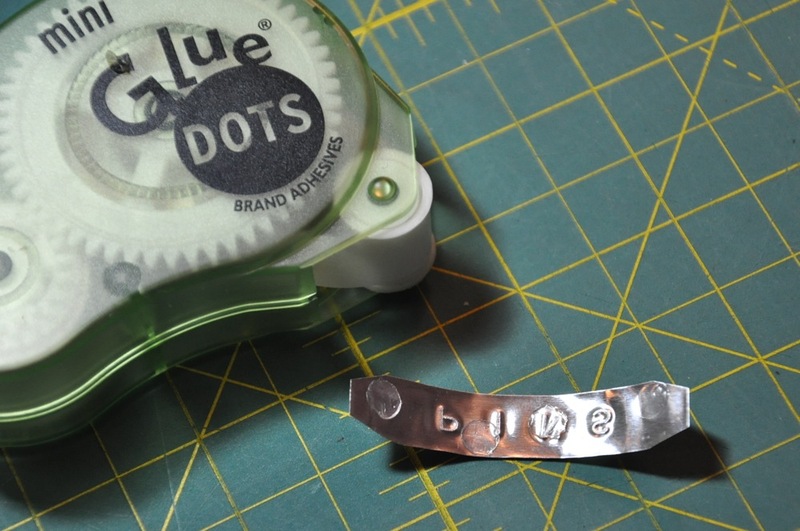 Press and rub edges to mold the metal to the bowl. Consists of gluing the pincushion into the bowl. 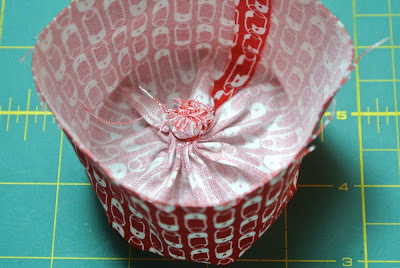 I used hot glue and applied it to the inside of the porcelain bowl and then pushed the fabric pincushion into the glue and did any quick adjusting before the glue set. 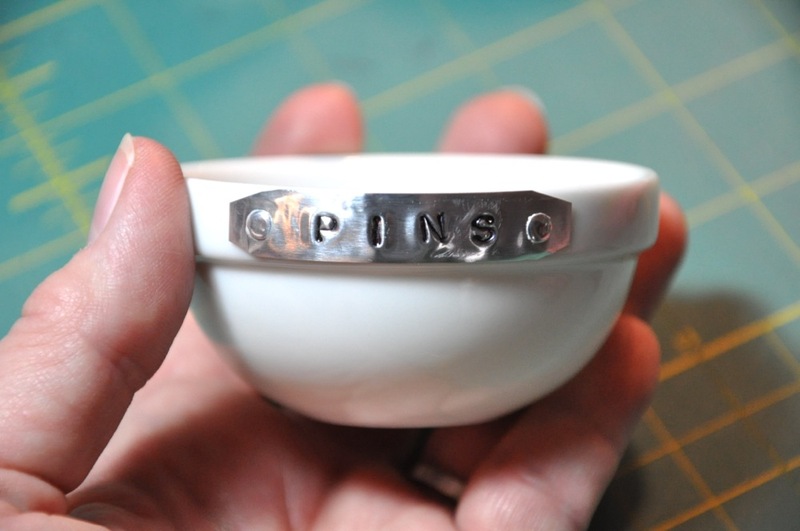 Hold your hand over the pincushion and firmly hold in place until the bowl cools off. 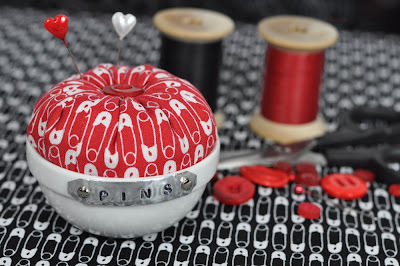 Your Pincushion is now complete! 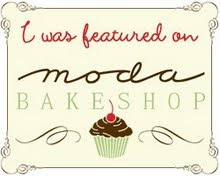 I do hope you enjoyed this little adventure with me. 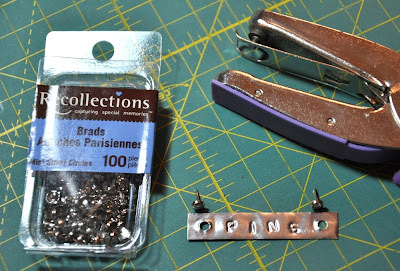 Here is Part 2 of the Bitty Bowl of Pins Tutorial. 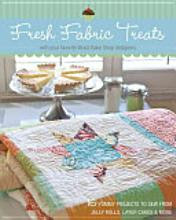 I hope you were able to locate the supplies to make this little project. Remember though that you can use any fabric to make this pincushion. 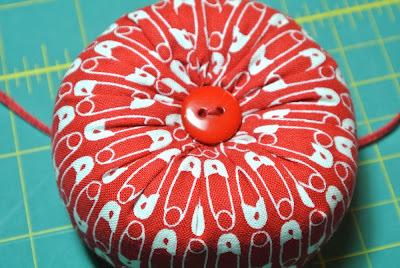 I will have to make a few pincushions out of other fabrics to inspire you. 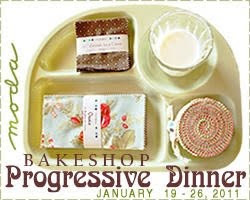 Here's a picture of what you'll need. Cut your piece of fabric to measure 4.5"x9.5"
Fold the short ends (5") together. Sew right sides together using a 1/4" seam allowance. 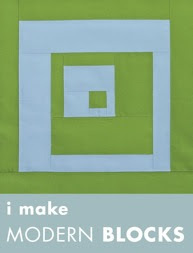 Pull a length of quilting thread from the spool measuring about 36" long. 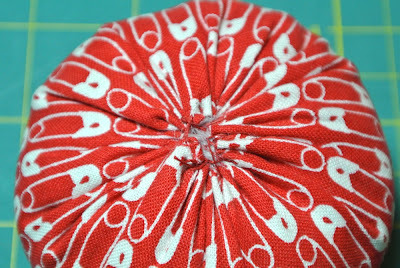 Thread needle and knot one end. 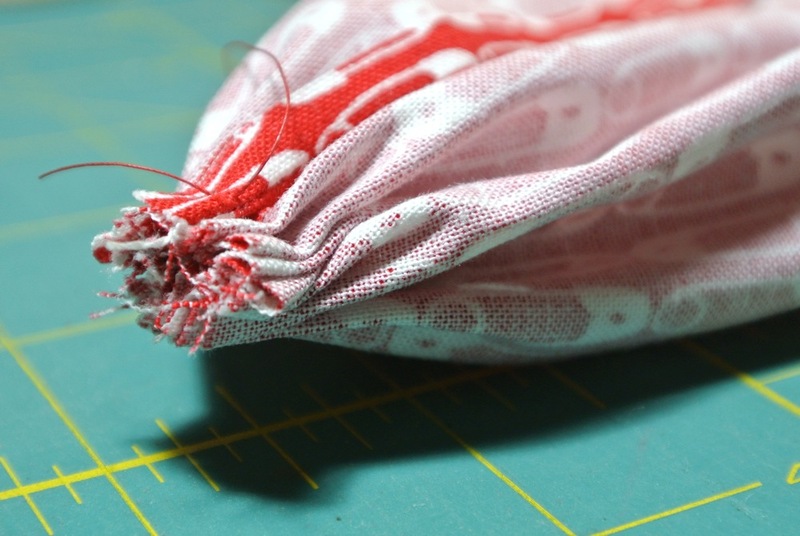 Measure down a 1/4" and sew a running stitch around one raw edge of the fabric. 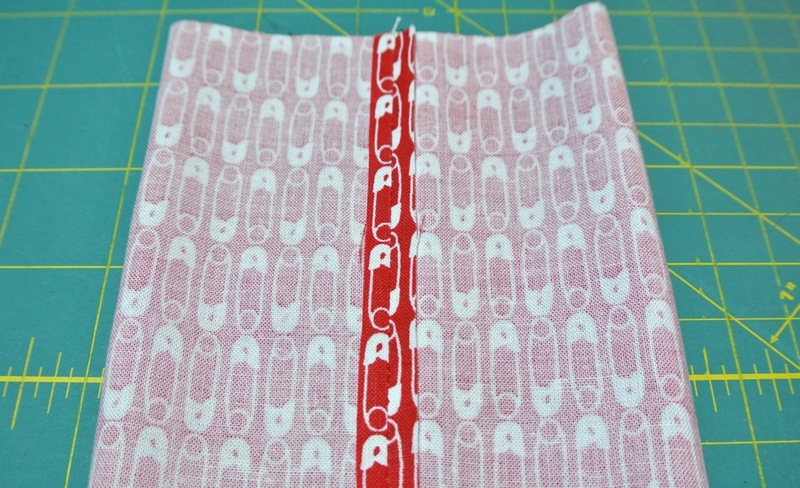 Pull the running stitch tight to pull the fabric in. Wrap the thread around the gathered fabric. 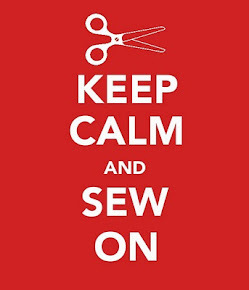 Secure the thread, tie a knot, and cut the end of the thread. 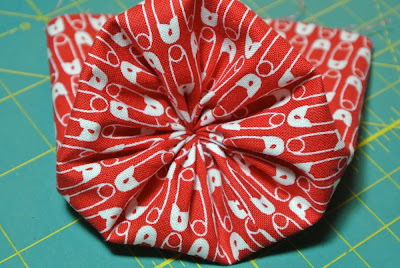 This will become the top of your pincushion. Here's a view looking in. 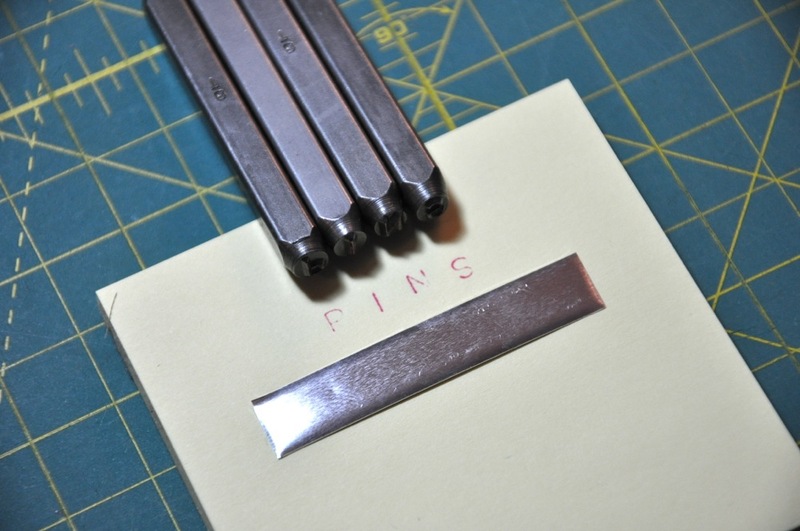 Fold the top edge down 1/2" and press. Sew another running stitch close to the top edge of fold line. Pour in a generous 1/2 cup of crushed walnut shells. Put in a little stuffing to prevent the crushed walnuts from leaking out. 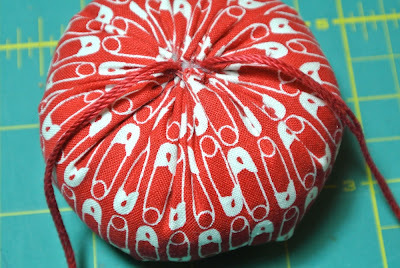 how tight you want your pincushion. You don't want it too tight because you need to mold it to fit into your bowl. 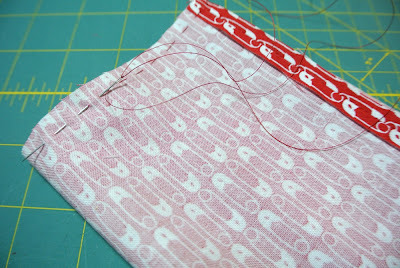 Just take out or add to it before you sew up the end. 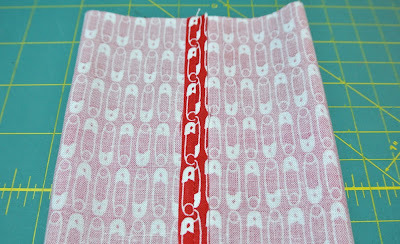 Sew opening closed by criss crossing the thread from side to side across the pincushion. 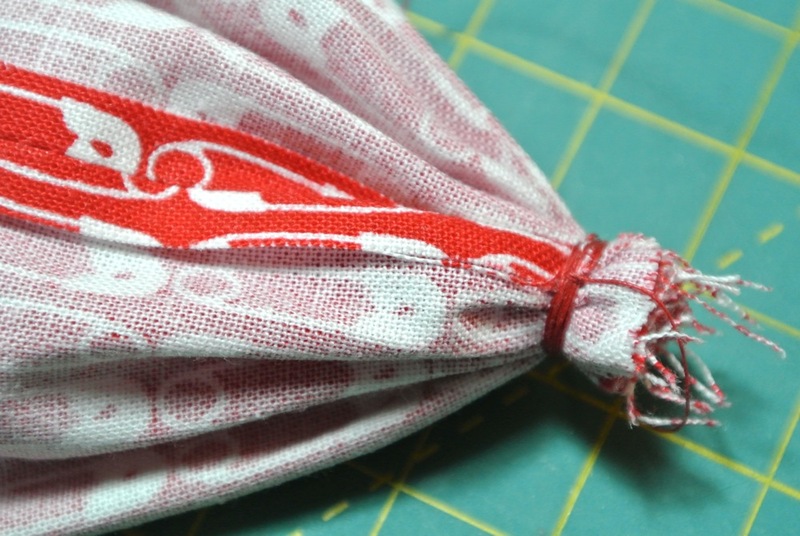 Secure thread, knot, and cut off the end of the thread. Cut off a piece of crochet thread measuring about 20"
Thread a long needle matching ends of thread. 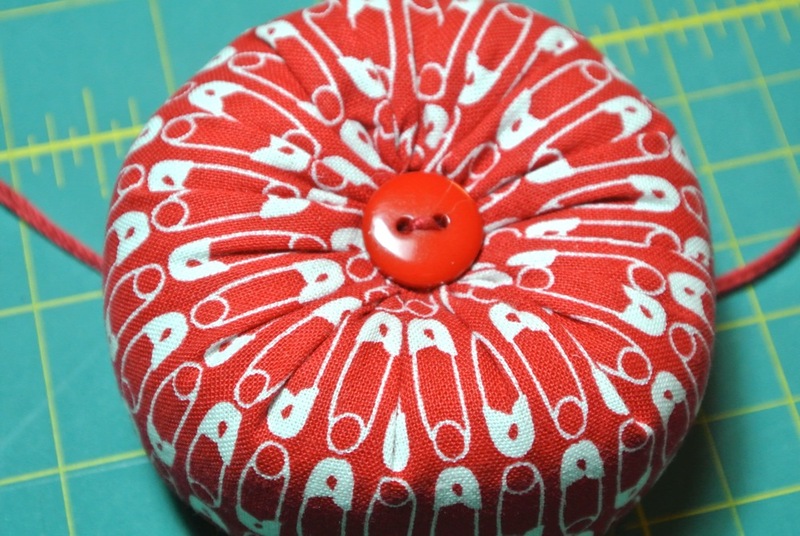 Insert needle at bottom of pincushion pushing through to the top. Then thread through one side of a two hole button and then through the other side of button and down again into the pincushion and out through the bottom of the pincushion. Tie 2-3 knots in your crochet thread then cut tails within about an inch of knots. You may place a bit of glue on the knot to keep it secured. 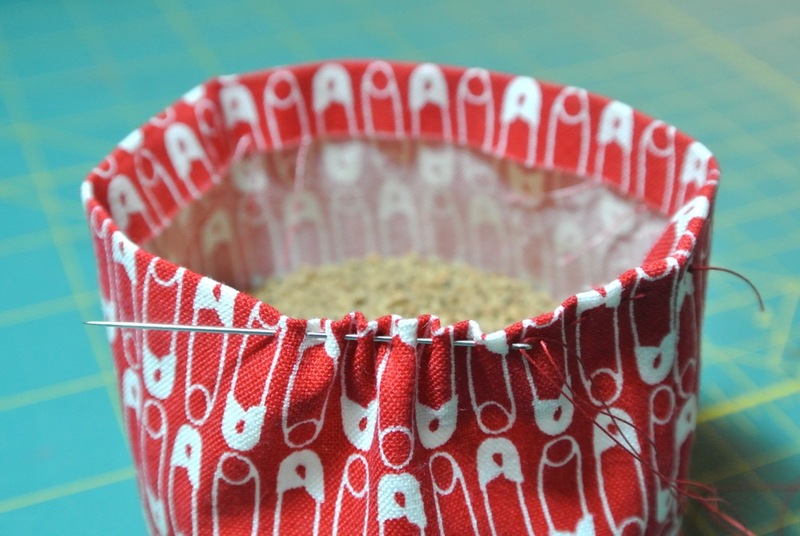 Do not cinch your thread too tightly as you will want a bit of give when you smush it in your bitty little bowl. Turn it over to see your finished pincushion. 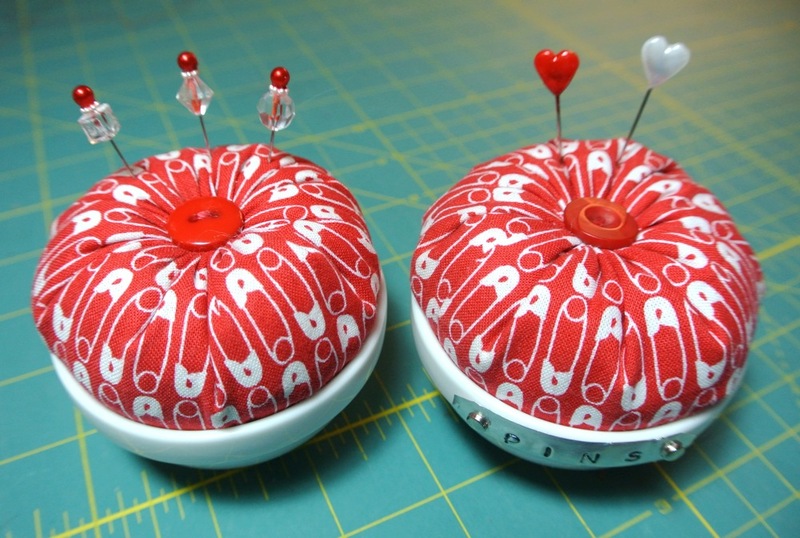 I've made two pincushions, so far.